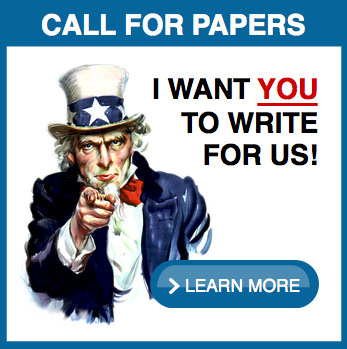 Last year, the RAND Corporation published a report examining the response following Hurricane Sandy in 2012. 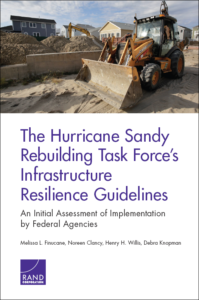 RAND’s report assesses the Hurricane Sandy Rebuilding Task Force’s Infrastructure Resilience Guidelines, and the implementation of those guidelines by various federal agencies. 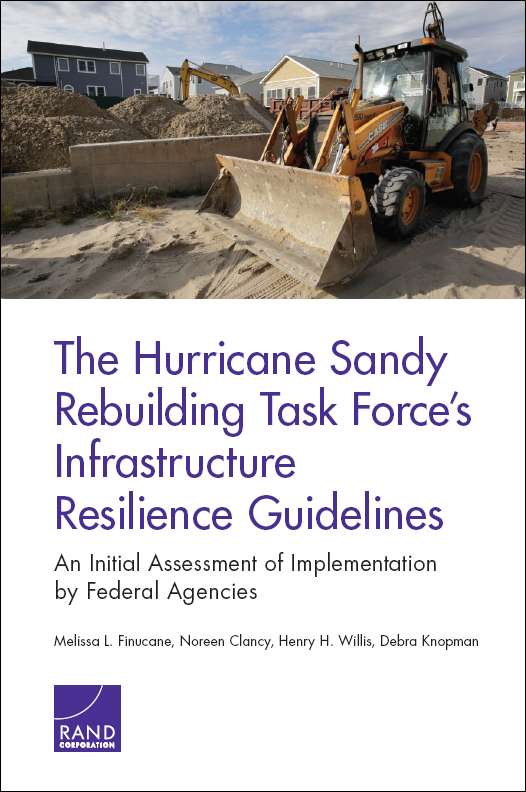 The task force’s guidelines, which were developed in 2013, are aimed at ensuring federal agencies have a consistent approach to building resilience and at improving decisionmaking to better protect communities. 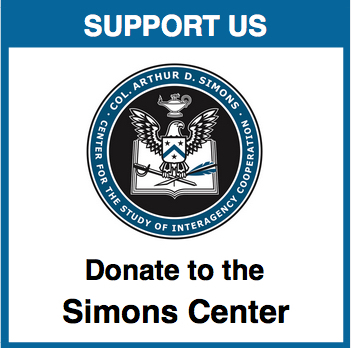 The guidelines focused on comprehensive analysis, decisionmaking, resilience, and long-term sustainability, among others. RAND conducted an initial assessment of federal agencies’ implementation of the guidelines, examining how the guidelines had been implemented, and identifying lessons learned from implementing the guidelines. RAND also considered whether the guidelines could be implemented when allocating federal funds for infrastructure in nonrecovery environments. During their analysis, RAND found that the Infrastructure Resilience Guidelines reinforced the approach to resilience principles that many agencies have been pursuing in recent years. RAND also found that the guidelines echoed themes found in the President’s Climate Action Plan and various other documents from the Executive Office and federal agencies. The main challenges identified by RAND’s research highlight common difficulties in complex interagency initiatives, including finding the right level of specificity in the guidelines so that they can be applied broadly yet meaningfully across diverse sectors and locations. For more information about this report, please follow the link below.